Cook pasta shells according to package directions. Drain, separate onto baking sheet and let cool. In a medium bowl, stir together ricotta, pumpkin, Parmesan, and spices. Reserve 1 Tablespoon Parmesan for topping. Preheat oven to 350 degrees. Choose a baking dish that holds all the shells in a single layer. Spread pasta sauce in the bottom of the baking dish. 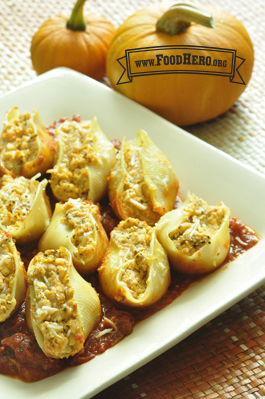 Fill each shell with about 3 Tablespoons of pumpkin mixture, and place shells close together on sauce in baking dish. Cover pan with foil and bake for 30 minutes. Remove foil, sprinkle with remaining cheese and bake for 15 minutes more. Freeze unused pumpkin puree and add to soup, chili or pancake recipes. When kids help make healthy food, they are more likely to try it.